After experiencing health issues and difficulty sleeping, Terry Markert visited the Emory Sleep Center and was diagnosed with sleep apnea. He now uses a CPAP device to assist his breathing at night. “I have a lot more energy,” he says. Terry Markert is a big guy, but he used to be even bigger: at six-foot-one and 362 pounds, his weight was affecting his health. 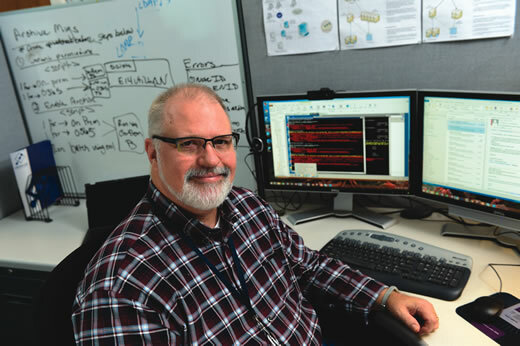 The IT administrator had been diagnosed with type 2 diabetes, was having joint pain, and was sleeping poorly—snoring loudly and frequently waking up startled in the night from not being able to breathe. “As the day wore on, I would have issues with getting sleepy, tired, fatigued,” he says. Several of his doctors had recommended bariatric surgery. But Markert decided to take two proactive steps first: he went on a diet with his wife, and he visited a sleep lab. He has now lost 46 pounds and uses a CPAP to assist his breathing while he sleeps. Nancy Collop, director of the Emory Sleep Center, arranged for him to have a home test while he slept. A monitoring strap was placed around his chest and midsection, and a nasal cannula measured airflow out of his nose. 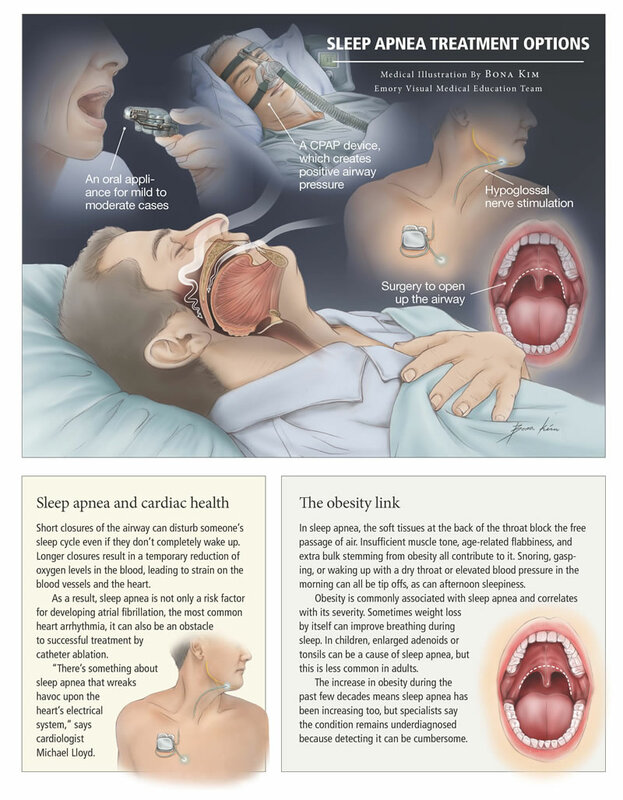 The results: severe sleep apnea. “I was off the charts,” Markert says. Collop recommended a CPAP (a device that provides continuous positive airway pressure) and then referred him to a respiratory therapist at the Emory Sleep Center to be fitted. He began using the CPAP regularly last summer. “It was a rough two or three nights when I was first getting used to it,” he says. “I felt like throwing it across the room a few times.” Soon enough, though, he got used to the device and began sleeping through the night. The more a sleep apnea patient is able to use CPAP, the better, both in terms of respiratory disturbance and alertness the next day. By any measure, adjusting to CPAP is a big practical change for a patient, and it requires daily cleaning. But when it works, patients notice. A CPAP is the standard remedy for the most common sleep disorder, sleep apnea. The mild air pressure prevents the soft tissue at the back of the throat from collapsing, cutting down on the frequency of all those gasps and snorts. “If a patient wears the device consistently, it will be effective,” Collop says. “With other options, such as an oral appliance, we tend to see a lower success rate.” Evidence has been emerging that CPAP can bring down blood pressure in patients who most need it—those with drug-resistant hypertension who have an elevated risk of heart attack and stroke, for example. For milder sleep apnea, the statistical benefits don’t pop out as much, but being more alert in the afternoons is still a quite valuable benefit. The pros: CPAP is not invasive and irreversible like surgery and does not require as much individual customization as an oral appliance. Thus, CPAP is what most sleep apnea patients will be urged to try first.